I get a little anxious when I get behind on my blog, and though I’ve certainly gone longer between updates, so much has happened that past two (almost three) weeks…. with no signs of slowing down. Despite my Instagram or our Facebook page for the intermediate updates, this platform continues to be my singular place to document and journal everything. This continues to be a huge personal outlet for me, and it honestly does provide a bit of relief when I’m able to organize my thoughts and write them out. At the beginning of October, Evanna began to exhibit some symptoms that she was coming down with something. We held out for a day or two in hopes to avoid a hospital admission -- as we have been given the tools to deal with minor illnesses at home – unfortunately, Evanna continued to deteriorate and we decided to pack her up and take her into emergency (October 5). Cardiology had alerted the ER of a potential visit, as we kept in contact with them from the moment Evanna became ill at home – and so along with her long list of diagnoses, we were immediately taken to the back and seen by the emergency physician without having to wait. After being assessed by the pediatrician, we were then assessed by one of the ICU intensivists for a possible ICU admission (protocol with most trach/vent kids). We of course knew the intensivist very well from last year, but we all agreed that clinically Evanna was “well”, and an ICU admission was unnecessary at this point of time, and we could proceed with going up to Unit 2. 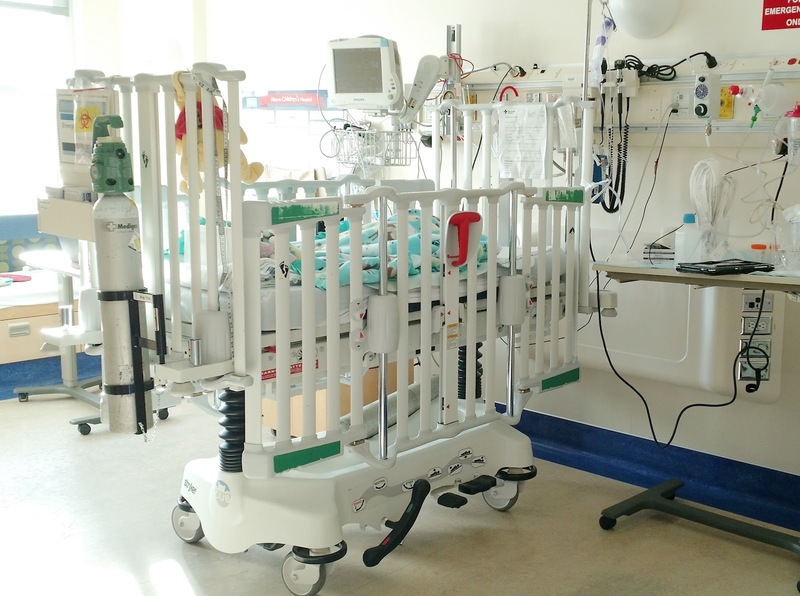 However, the “trach+ vent hallway” on Unit 2 was full…. so we ended up being admitted to ICU anyways (such is life). Within 12 hours of coming into hospital, Evanna’s clinical picture actually improved dramatically, and we began talking about discharge from the ICU and continue to support Evanna at home. However, the night before we intended to leave, her labs came back from the blood draw that we did in emergency, and they were positive for an infection (pseudomonas). They immediately started her on some antibiotics and we knew right away that we weren’t going anywhere fast. The following morning (October 7) a bed up on Unit 2 opened up, and so because Evanna was stable, we transferred up to the floor and settled right in, knowing that without a doubt we’d be in for Thanksgiving (marking the only holiday to date that Evanna has spent each year consecutively in hospital… though we’re cutting it close and will most likely see that same milestone for Halloween too). The first week or so was spent hanging out, talking to our regular specialists of the clinics we’re associated with (cardiology & respirology), and waiting for the infection to clear so we could proceed with a PICC line (a more stable IV line to administer the antibiotics through) that would allow us to go home. At one point another “bump” began to grow at the top of Evanna’s sternotomy and directly beneath her tracheostomy site, which had Cardiology and Infectious Disease freaking out and when we starting talking and communicating with Edmonton to keep them in the loop in case we had to transfer back up for another debridement surgery. One of the biggest highlights from our first week in hospital was having a few good in-depth conversations with one of our trach respirologists about some major concerns I have about our “trach journey” and what I would like to see happen over the next year. Last month we had a “combined clinic” appointment with our respiratory and ENT teams, and I walked out quite disappointed and defeated with how it all went. Essentially I felt we got a “it is what it is” type answer for working towards weaning Evanna off the vent over the next year and the severity of our situation is not being taking seriously. After talking to the trach Respirologist, I was able to better convey some issues and concerns we had, and come up with a more concrete plan to book another bronchoscopy soon and to keep some additional options on the table should things remain the same by next summer. We also saw cardiology lots throughout the week as we are dealing with an Endocarditis diagnosis, and so they’re keeping a close eye on everything and keeping the communication lines open with Edmonton, but for the most part we wanted to see if we can clear things with antibiotics alone, as a debridement or even another open heart surgery would be a very big deal and pretty invasive. About halfway through the second week, we noticed Evanna was getting a runny nose and concluded she had indeed caught a cold while in hospital. For the first several days it didn’t seem to cause any additional problems, but by day 5 (October 17) we began to experience issues with trying to maintain appropriate oxygen saturations. After hours of consistently bumping up her oxygen (to 10-12L) and administrating Ventilon every 2 hours (this helps treat wheezing and open the airways up), the unit called on the ICU to come assess Evanna and decide if we should transfer back down the ICU. Well, due to the fact that Evanna was surpassing the floor’s threshold and capabilities, they ended up just sending their transport team up to help pack us up and bring her back down to the ICU, as it was better to deal with this in a calmer state, than for things to progressively get worse and be rushed. 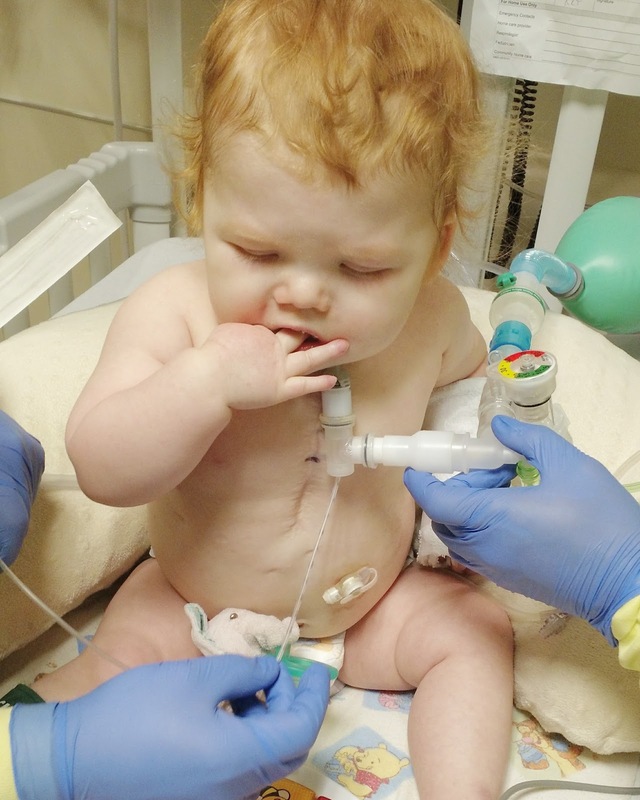 Down in the ICU they kept Evanna on 12L of oxygen, bumped her ventilator PEEP from 12 up to 14 and started her on a continuous Ventolin drip (it was hooked into the vent’s humidifier so that it could be pumped in through her vent tubing directly into her airway). 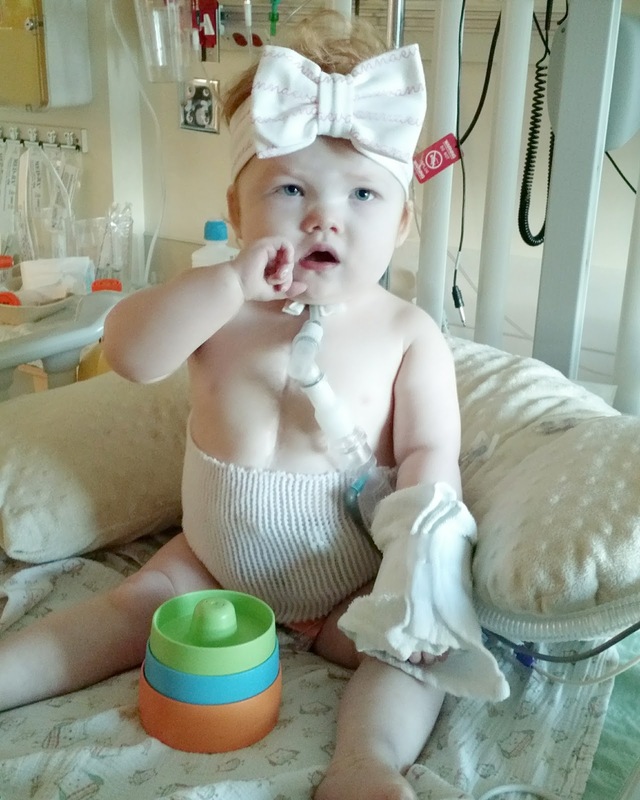 By the next morning Evanna started to improve and we were able to decrease the amount of oxygen she was on. Unfortunately we learned that we got yet another positive blood culture that started to really worry the whole medical team, as it had been over 2 weeks since starting Evanna on IV antibiotics. On Wednesday (October 19) one of the cardiologists that is helping us send down a referral to California (there are two cardiologists helping us with our referral – Dr. Fruitman, our primary cardiologist and Dr. Rutledge because of our history and relationship with her up in Edmonton) to Dr. Hanley for other open heart surgery, came in and explained the current situation and how this infection is starting to become extremely worrisome and could potentially interfere with our entire California plan. Infectious Disease feels it’s time we transfer up to Edmonton for surgical intervention to switch out her conduit that they are certain is now “seeded” with Pseudomonas. While the IV antibiotics are somewhat clearing her blood, they think the conduit continues to “reinfect” everything. The problem with that, is it’s “easier said than done”, especially when we’re pursuing a different/another open heart surgery down in California by Dr. Hanley. So Dr. Rutledge informed us that they rushed the referral down to California that evening and have asked for an expedited answer so we can better plan on how to proceed over the next few weeks. On Thursday (October 20), Infectious Disease and Cardiology decided to have a meeting, as they continue to somewhat disagree on what needs to happen. I was working, so Nick attended it by himself -- as we are continuing to try and work around each other’s work schedules so that one of us is always at the hospital with Evanna. Basically, Infectious Disease reiterated that Evanna needs surgical intervention, however Cardiology is saying that going back to Edmonton to change out the conduit is more complicated than it sounds. We are hoping to hear from California in the next week or so and essentially wait to transfer Evanna down there to have the open heart surgery we want to do and change out the conduit at the same time. However, in the same breath, the cardiologist made it known that she honestly thinks Evanna’s case is somewhat beyond Dr. Hanley’s capabilities and believes he will tell us that there’s nothing more he can do. If so, while our next option would be to go to Edmonton to change out the conduit, the cardiologist asked that we consider our options very carefully and weigh out how much we want to continue to put Evanna through, as again, another open heart surgery to change out her conduit is much more complicated than it sounds, and they really worry about how she’d do from a recovery standpoint. Nick and I have been through this before, and if anything, it just continues to get harder to talk about the older Evanna gets. We’re absolutely stunned that we are having to talk about this again so quickly, and it truly leaves you breathless. So where are we now? Well they did a CT on Thursday to both assess the bump at the top of her sternotomy and have a fresher angiogram to send down to Dr. Hanley (which was immediately sent by FedEx). The good news is the bump continues to improve and I guess it’s a good thing to have fresh imaging for Dr. Hanley to base his decision on. We finally got a PICC line yesterday morning as we’re running out of IV sites (which went well) and we’re somewhat in a very nerve-wracking “holding pattern”, as we wait to hear from both California and Edmonton with their opinions. As of today, we have finally gotten THREE NEGATIVE BLOOD CULTURES in a row, which is allowing us to all breath a little sigh of relief and feel a little less rushed with our decision making. Evanna has also back to her “baseline” from a respiratory standpoint (down to 4L of oxygen, etch) since catching this cold and so we transferred out of the PICU and back up to Unit 2 this afternoon. Tomorrow is Monday, which means we’re in for a very busy day with hopefully trying to come up with a discharge plan. 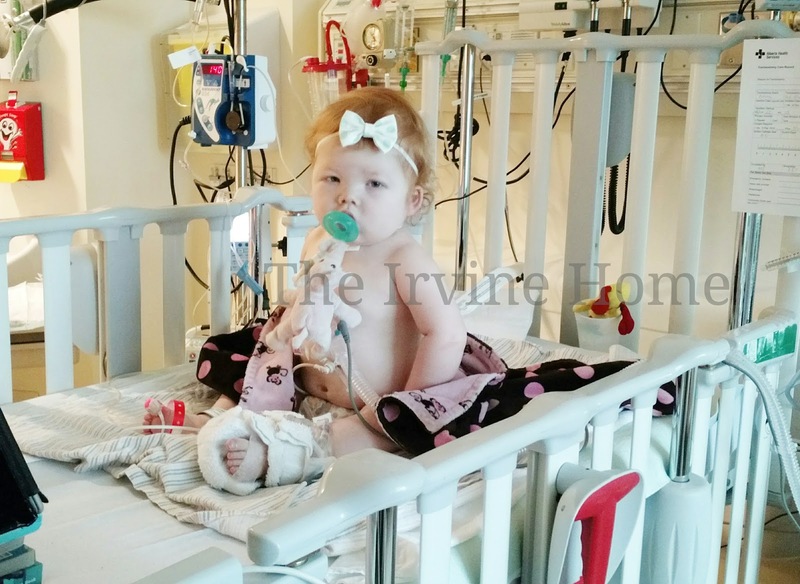 Yes, we have a PICC line, but Evanna is still on TWO antibiotics, and they generally don’t let you do Home Parenteral Therapy Program (HPTP) on more than one IV drug. I’m honestly hoping we can come up with some sort of compromise as the longer we’re in hospital, the chances of Evanna catching another cold increases – especially this time of year. Our most acute issue right now is Evanna has gotten a little “backed up” with poop this past week and is incredibly uncomfortable. We’ve been working on clearing her out the past few days (yeah laxatives), but we still have a little ways to go based on her grumpiness level and continued periods of retching (especially when we sit her up). This hospital admission has been probably one of our most brutal to date emotionally (especially the past 5 days). We were admitted due to an infection (that is finally showing signs of clearing), but we’ve been forced to see the reality of our situation. At home, all we see is a happy and thriving Evanna, but the truth of the matter is, on the inside, Evanna is slowly fading. We no longer have pulmonary blood flow to her left lung (and there is NO way to surgically fix that…not even Dr. Hanley), and the fact we have not been able to make any progress in decreasing the amount of ventilator and oxygen support Evanna is on since last year, only confirms our greatest fears – we are eventually going to lose Evanna, and it’s only a matter of time (to clarify, it could certainly be several years, and a transplant is NOT an option due to how her heart and lungs are uniquely intertwined). We are still waiting to hear what Dr. Hanley has to say, but our medical team has stated that even IF Hanley comes back saying he might be able to help improve Evanna’s quality of life, it will come with many risks attached to it. Nick and I are generally on the same page in regards to the “bigger decisions” and have known for quite sometime that Evanna is terminal, but the team has asked that we start to discuss the smaller details in regards to how aggressive we want to be and evaluate what’s important to us (which at this point I will keep private, as according to our medical team “there is no wrong answer”, and so those details will remain personal and not be posted for public opinion). Thank you to everyone who continues to pray for Evanna and support us. I DO read each and every comment, message and text sent to me (sorry for my terrible responding skills), as they truly help lighten and uplift us. Our situation continues to remains incredibly hard, and so our hearts ache under the weight of this trial that Nick and I are having to endure and the decisions that we have to continuously make as parents. My heart goes out to your family. I cannot even begin to imagine what it is like to be going through what your are facing. I pray for continued and miraculous healing for Evanna and that she doesn't pick anything else up from the hospital, guidance for making the upcoming medical choices, the doctors to make the best decisions for her, and the ability to just enjoy every minute you get together. Big hugs. I can't imagine how tired you must be. It's a judging act between being a mom, working, a wife and having contant "bumps" in the road. Big and little. My heart aches for you every time you post an update about another let down or change of plans. Somehow though you manage to see the silverlining and hold out hope. You and your husband are such GREAT parents and I'm sure whatever your choices are- you did not arrive without some serious soul searching and prayer. Prayers and love going out to all of you. You both are incredibly wonderful parents and Evanna is such an inspiration, as you all are. Whatever choices you are going to have to make I know it will be the best as Evanna is truly blessed to have you as parents. Much love and prayers. Prayers for you, you beautiful mama. Evans is always in our prayers. My little girl needed a minor surgery and Evanna gave us the strength to book it and proceed. By following your journey, it inspired me to be strong.Thank you for your beautiful example. I wish I had something wonderful to write to bring you some comfort, but I'm at a loss. Please know that I am continually praying for all of you. Thank you for posting the update Kierra...our hearts and prayers are with you all. I have walked that journey..and I can only tell you, Heaven's Grace will guide you and carry you through it all. You, Nick and Ivanna are truly amazing!! Ivanna will guide you through...just as she has all along. So much to teach you both...with tears..and mothers love...I pray for you all. Hugs!! Continuing to pray for you, Nick, and Evanna! I can't imagine the heartache of this roller coaster ride that you guys are on? I pray for you and Nick specifically, for strength (physically, mentally, and emotionally), courage to do what YOU feel is best for Evanna, and for wisdom in all of these things....and most of all....for peace that surpasses ALL understanding! Much love and prayers from Atlanta Georgia! Many prayers to you and your family. I am a respiratory therapist and have been following your story for a while now and it is truly touching how beautiful of a family you have. The Dr's are right. There is no wrong answer. When if comes to your children the only people able to understand why you choose what you choose will be yourself and your husband. Regardless of the outcome it will be the hardest thing you will ever face. Just remember you make your decision out of love and nothing could be wrong with that. From California I will be keeping Evanna in my thoughts and prayers. Many prayers to you're precious baby girl!!! I've been following you're page for a while.. I hope God answer all our prayers and you're beautiful Angel gets better. Wouldn't we love to see her home where she belongs. My heart bbreak for you, I pray that God gives you and the family strength.